Montreal, Quebec – With less than a month away, preparations are well underway to launch the first “Roots, Rhymes, and Resistance" in Montreal. Using the theme of “Pinoyville” (a colloquial term used by members of the Filipino community), this show is meant to be an empowering medium for the Filipino-Canadian youth to create a community identity and to celebrate their forms of resistance through different forms of expression of spoken word, music and art. This historic event will be held at L'Auberge on 3480 Queen Mary Rd. in Pinoyville (Cote-des-Neiges), on Saturday, December 12, 2009. Performers include local Filipino talents like Sinag Bayan Quebec Cultural Arts Collective and more! Roots, Rhymes and Resistance (RRR) was first introduced through sister organization Ugnayan ng Kabataang Pilipino Sa Canada/The Canadian Filipino-Canadian Youth Alliance BC (UKPC-BC) in 1999. “Roots Rhymes and Resistance has become one of the only annual programs that not only gives an outlet for youth to voice their concerns and issues, but is action towards our community’s settlement and integration in Canada”, says Charlene Sayo creator of RRR. While RRR raises awareness among the community it has become a tool for empowerment by providing new experiences, skills building and opportunities for Filipino youth to further explore their potential as contributing and participating members in our community and Canadian society. “I’m very excited to see RRR develop in Montreal” said Neil Castro, secretary general for Kabataang Montreal, “It is a chance for KM to work with the youth, as they express themselves, and resist against barriers to integration”. Forming in 2000 as a Filipino youth organization based in Cote-des-Neiges, KM has organized Filipino youth to address the pressing issues facing the community. Issues such as settlement & integration, systemic racism & economic marginalization, family separation, high drop out rates, barriers to education & employment, gender oppression are among the issues that KM tries to address and educate to the Filipino community in Montreal. 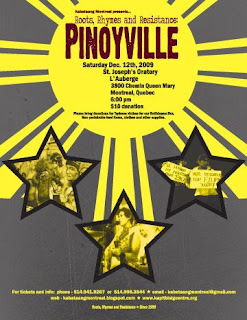 For instance, the very first production of Sinag Bayan (under the KBC) was the theatre production of “Pinoyville”, a play showcased in Toronto and Montreal. The play highlighted the reasons why Filipinos migrate abroad, and the subsequent difficulties they face in integrating within the Montreal diaspora. Drawing on this theme, “Roots Rhymes & Resistance: Pinoyville” connects the arts with education and awareness. This medium is instrumental in connecting our personal narratives to the community, and is an alternative to developing a deeper/political understanding of the marginalization and social barriers we face. The objective of Roots, Rhymes, Resistance: Pinoyville is to raise the awareness of the community’s issues through arts and culture while mobilizing the entire community and connecting to their personal experiences. Such initiatives give space for youth members to rise up and take ownership of their conditions and lived experiences – since they are ultimately the ones who will advocate for the betterment of our community. This is an ongoing initiative to strengthen our national work, to give our community a stronger voice. Next year, UKPC-BC, UKPC-Ontario and KM will be collaborating to bring artists and youth from all over the country to showcase their talents, and to speak out on the relevant issues pertaining to the Filipino population on a national level. For tickets or more information please contact Jillian (514) 941-9267 or Tracy (514) 995-3544.